Whatever happened to Dundee United? As fans of Scottish football, the chances are that if you’ve got a Twitter account then you’ll have seen the Dundee United: The Banter Years thread. If you haven’t, you should, because it’s both funny in general and slightly depressing for fans of the club. Having gone through it, it occurred to me that comical PR, poor players and bad management is just what neutral observers must expect from United now. But unlike the season we were relegated, or even in our first season in the Championship, I get the feeling that those neutral observers just don’t care any more. Coverage of United’s decline is now so few and far between that the club may as well be renamed “Whatever Happened To Dundee United?”. If you listen to the radio, despite United objectively being the 6th biggest side in the country with the fan-base to back it up, the chat on the radio is that Scottish football has reset so that “All the top clubs are back in the top flight”. It is, as so many of my fellow Arabs are quick to point out, embarrassing. But then again, at this point I should be sitting here writing about how there are signs of recovery. The main villain in the story of Dundee United’s decline – Stephen Thompson – is gone, and his replacement Mike Martin has done a lot that even the most cynical of United fans must agree is positive. On the face of it, we’ve got a better reserve and youth coaching structure, a scouting network that is supposed to extend beyond looking at YouTube videos, fresh blood in the board room and a better vision for generating income off the park. Moreover, we’ve punted a lot of the underperforming and allegedly disruptive elements in the dressing room. 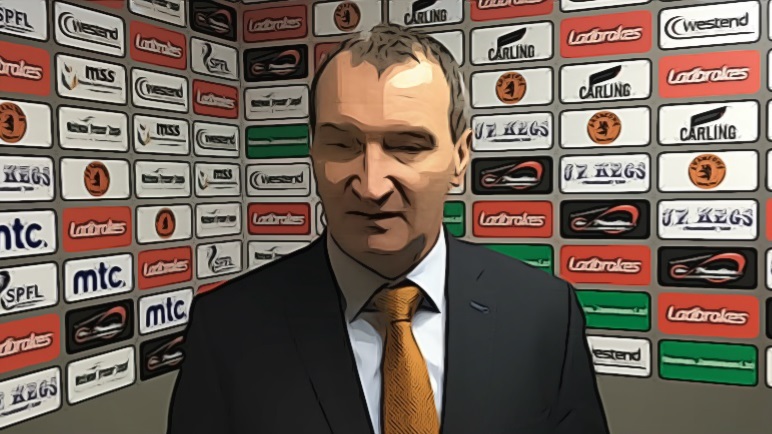 And yet one game into the league season, a return to the top flight seems further away than ever, and unfortunately, that seems to be down to one man: Csaba Laszlo. Now before I go on, I must say I think the amount of personal vitriol aimed at poor old Csaba is uncalled for. Yes, he waffles on and has trouble communicating effectively, but to me he comes across as a passionate and likeable guy and is certainly not someone worthy of feeling personal animosity towards. However, the facts are what they are, and while he’s been in charge United have been dreadful. The style of play is awful and the results are even worse. Even in the poorer times under Ray McKinnon – who for the avoidance of doubt deserved to be punted himself – you could turn up to Tannadice and feel like the chances of a good result at home were high. Now we’re the team who smaller clubs visit to end 50-year-old winless streaks. This season, despite making 12 signings (possibly 13 by the time you read this) we’ve looked like a side without a single ounce of creative flair, and the defence still contains proven duds like Jamie Robson and William Edjenguele. If you were looking to see things in a positive light, you could say that certain key players are still injured and, with the addition of a flair player, once the team gels they’ll look like a force to be reckoned with in the Championship, but surely every Arab knows in their heart that the problem is the manager and his tactics. As stated above, he has trouble communicating succinctly. If he’s asked what day of the week it is, the answer will last for 15 minutes and contain the word “generally” above 6000 times, and that simply must be difficult for the players to cope with. I don’t doubt that in his head he has an idea of exactly what it is he wants his team to do, and in theory that might work well, but he’s either not getting that plan across, the plan itself is flawed, or both. It’s not working, and right now we look more likely to finish in the relegation play-offs rather than the promotion ones, let alone achieve the minimum expectation of the league title. The question to ponder is this…could another manager get more out of these players? It’s rare for United fans to be…well…united, but I think in this case everyone would agree that the answer is yes. So while Laszlo seems like a nice guy, there’s a good chance that the old adage that nice guys finish last may come true in the Scottish Championship this season. He’s got to go, and barring a miraculous turnaround in fortunes he will. But whether that happens before it’s too late to save our season, only time will tell.